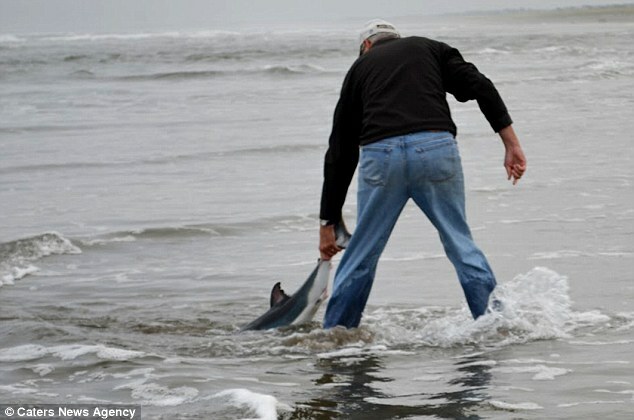 These heartwarming pictures show the moment a man rescued a tiny beached shark and released it back into the sea. 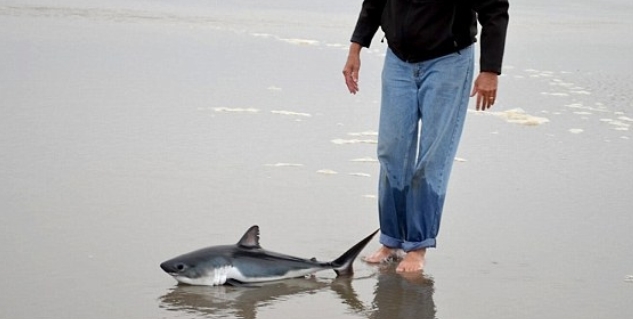 Alan Holyoak, 56, came across the stranded shark when he was out for a morning walk with his wife Kathrine at the beach in Seaside, Oregon. The marine biologist picked the 46-inch long shark up and, after a few tense minutes, it was soon gliding back through the waves. Mr Holyoak, from Idaho, recalled: 'We saw a young girl looking at something in the water. It was at least a few feet long. 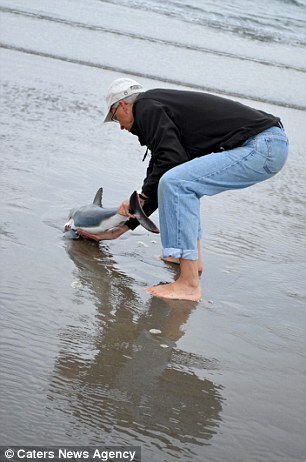 'At first I thought it might be a stranded dolphin or porpoise pup. But when I ran over and got close enough to see it was a shark, I had the shock and thrill of my life. 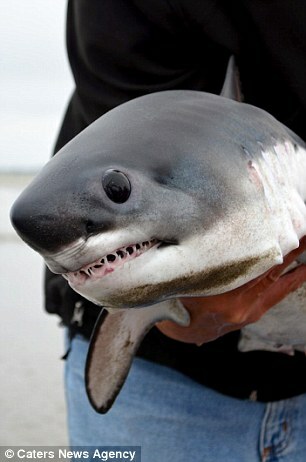 'It was only around 46 inches long, but it came with a full set of teeth. 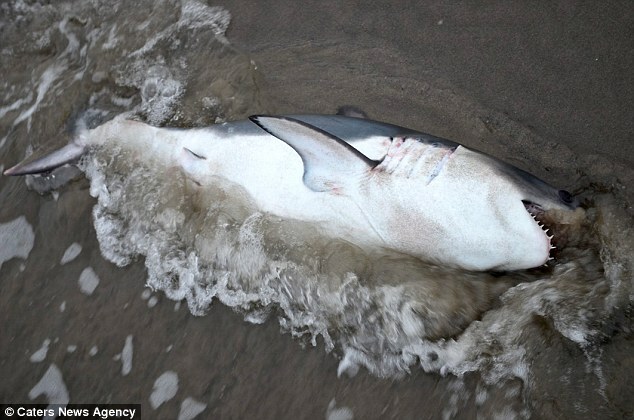 'The shark was being rolled around in the surf and was under obvious and extreme stress. It showed no signs of life, but it was still very flexible so I thought it had a chance.' The marine biologist then grabbed it and carefully removed it from the beach, extremely wary it could thrash around at any time. He said: 'As it was so lethargic I decided to pick it up and take it back out into the wash zone, where there was a lot of highly oxygenated water - just what it needed. 'I gave it a gentle shove, launching it toward deeper water - surprisingly it started to beat its tail fin. 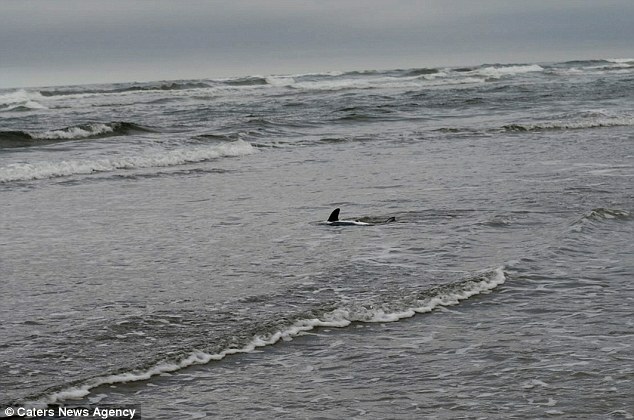 'It was having a hard time, but at least it was getting back into the waves - luckily it managed to get its bearings and make it into deeper water. 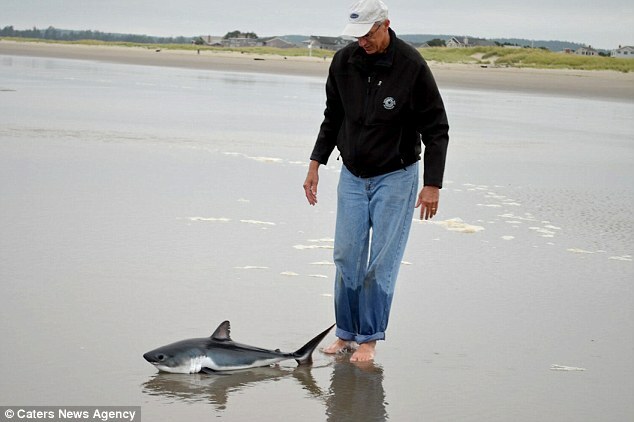 Responses to "Man Picks Up A Stranded Baby Shark And Releases It Back Into The Sea"
Very good job, getting it to breath again. We need our sharks to keep the oceans healthy, of course we are not helping one bit, but I like the thought of this little creature trying to make it. I like that he picked it up. Many people don't know you can suffocate them dragging them by the tail as sand stuffs their gills..
Lucky this man came along when he did.